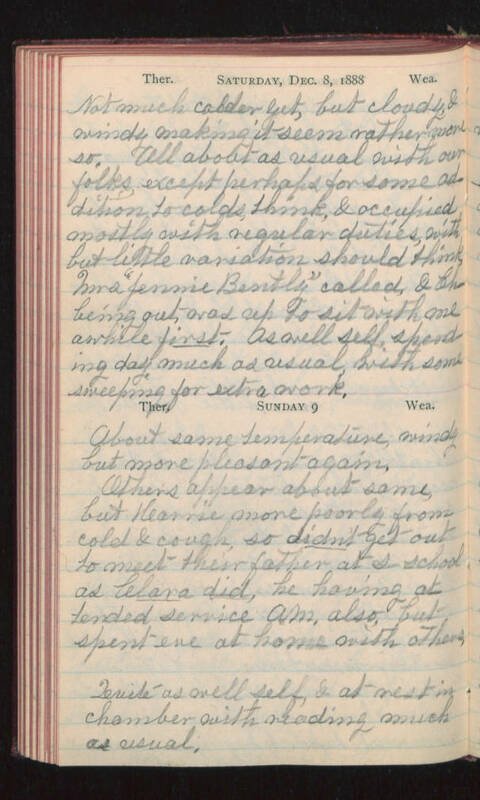 Saturday, Dec. 8, 1888 Not much colder out, but cloudy, & windy making it seem rather more so. All about as usual with our folks, except perhaps for some addition to colds, think, & occupied mostly with regular duties, with but little variation should think. Mrs "Jennie Bently" called, & Ch- being out, was up to sit with me awhile first. As well self, spending day much as usual, with some sweeping for extra work. Sunday 9 About same temperature, windy but more pleasant again. Others appear about same, but Karrie more poorly from cold & cough, so didn't get out to meet their father at s-school as Clara did, he having attended service A.M. also, but spent eve at home with others. Quite as well self, & at rest in chamber with reading much as usual.